Mitsubishi Electric Corporation has released a Ka-band (26 to 40 GHz) 8W gallium nitride (GaN) high-electron mobility transistor (HEMT) monolithic microwave integrated circuit (MMIC) amplifier for satellite earth stations. The new MGFG5H3001, which offers low distortion and an output power rating of 8W, boasts a small footprint that will help to downsize power transmitters. Mitsubishi Electric will begin shipping samples of this MMIC on November 1. Satellite networks, which are used for high-speed communication during natural disasters and in areas where ground networks are difficult to construct, are currently implemented mainly in the C-band (4-8 GHz) and Ku-band (12-18 GHz), but higher frequencies are increasingly being used. Also, market demands for deployments in the higher-frequency Ka-band are increasing. 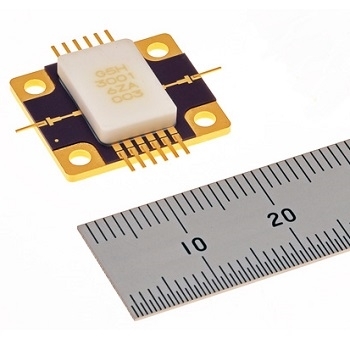 Mitsubishi Electric's new Ka-band GaN-HEMT MMIC will help meet the growing demand for higher frequency deployments, as well as facilitate the development of satellite communications equipment capable of extra-high output power and efficiency. More News From Mitsubishi Electric US, Inc.